Doctor Who: One Primitive Planet In One Century In Time? | Warped Factor - Words in the Key of Geek. Doctor Who: One Primitive Planet In One Century In Time? Chris Morley is stuck on Earth. With all signs pointing towards the newest of the Doctors being given little choice but to hang around on Earth at least for a bit having been thrown from the TARDIS - park those "women drivers" jokes at the door - what better excuse to look back at when her Third & most definitely masculine incarnation was seemingly similarly condemned? Perhaps a large part of that was due to the greater leaps of imagination splashed across a limited temporal canvas thanks to a budget cut - less ready cash meaning fewer corners of the universe to visit, however many terrible things they've bred! Hence the Doctor getting his first taste of the workday grind as a scientific adviser to UNIT, their beginnings going back to the final days of the little chap with the recorder whose assistance will eventually prove invaluable in earning a reprieve for the man he will become, allowing him to resume his travels across time & space before regenerating & at least metaphorically handing in his notice. Spearhead From Space, then, had quite a job to do. 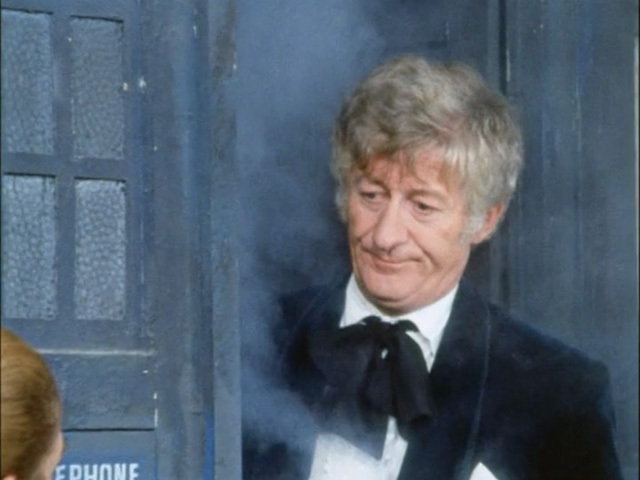 Could Doctor Who really work in light of everything being stripped back? Luckily the answer was an emphatic yes, Pertwee & Caroline John as companion Liz Shaw rocking up in a similar vein to The Avengers' John Steed & Mrs Peel & putting a stop to the plastic plans of the Nestene Consciousness, the first example of the seemingly ordinary (in this case shop mannequins) given terrifying new purpose. 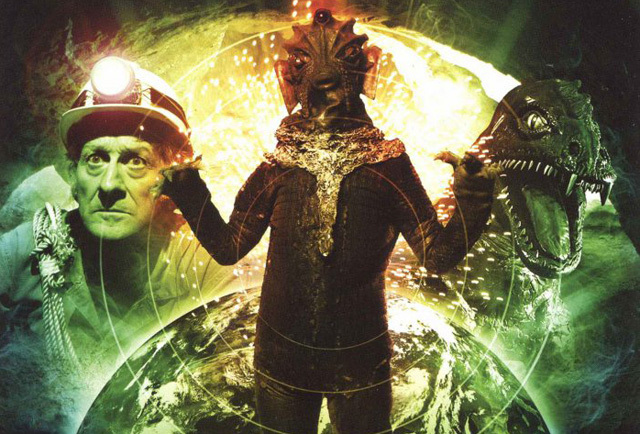 Our incoming showrunner must have taken more than a little inspiration from the next story in the run - The Silurians providing plenty of material for Chris Chibnall's later attempt to resurrect them in the two-part The Hungry Earth / Cold Blood. Not least a very similar basic plot as the race also known as Eocenes or homo reptilia are woken up after thousands of years of underground slumber by the pesky apes who've evolved all over it while they've been asleep. The cheek of it, eh? At least having come to an arrangement with the Brigadier, a suitable negotiator, in the form of the Doctor, is on hand to try & make things run as smoothly as possible between the warring parties. Salary of course was not a sticking point, though he does wangle himself a laboratory! There's also a rather lovely company car to go with the job. The scene is set, then, for everything pre-The Three Doctors. Although Colony In Space throws up something of a caveat in that the Venusian Aikido is allowed to go off-world if those who plonked his feet firmly on Earth's soil say he can. Whether he actually fancies it or not! Conveniently enough they choose the exact moment he's giving his new companion Jo Grant a tour of the facilities to whisk them both off to hopefully get them out of some rather deep doo-doo relating to a doomsday weapon, another one of their own having designs on it. JO: The doors have closed. JO: Doctor, let me out of here. DOCTOR: Well, I can't, Jo. I think we're taking off! DOCTOR: I'm trying to. Something's operating it by remote control. The Time Lords! A shorter series for the Thirteenth Doctor - believed to be ten episodes in length - might also lend weight to the harking back to the days of the Third, whose first season comprised just four stories, admittedly over a greater number of weeks, another one added on to the end of each subsequent series prior to his bowing out at the conclusion of Planet Of The Spiders. By no means did the reduced episode count do Doctor Who any harm - if anything the contemporary setting & later its influence allowed them to better reflect what was going on in the world as it was in the Seventies, its pinch felt by everyone working to bring new adventures to the Saturday tea time audience of the period. Consider the concern for the environment as demonstrated by the likes of Invasion Of The Dinosaurs & The Green Death, the echoes of the miners strike & Britain's entry into the European Union across two visits to Peladon & a critical stance on the South African policy of apartheid in The Mutants, during which the Doctor is once again used as a messenger by the very kin who'd taken away the temporal freedom he'd somewhat taken for granted! Looking further ahead it surely can't be pure coincidence that in bringing him back for a whole new generation eating chips & watching telly Russell T Davies subtly recycled the best bits of Spearhead in the Ninth Doctor's introduction as well as cribbing from an almost painfully modern soap opera format to begin with, centering on this Northernmost of Gallifreyans wangling his way into Rose Tyler's humdrum life on the Powell Estate & offering her the chance to see the universe across thirteen episodes. 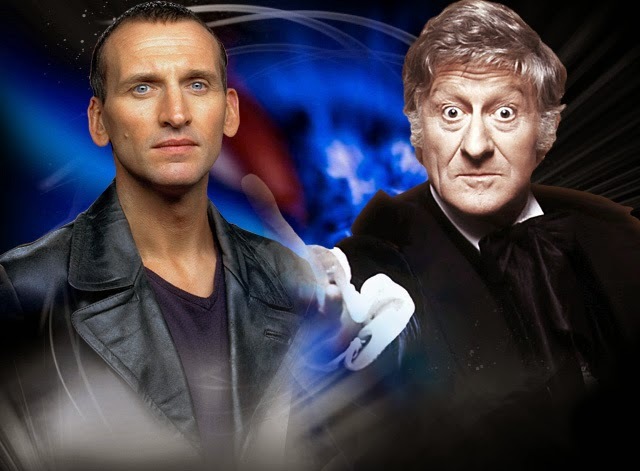 By Dalek we're back on familiar ground, an appetiser before the residents of Skaro's final gambit is revealed with Satellite Five & its constant infotainment drawing on various facets of the popular media & debates surrounding it as of the mid Noughties as the Bad Wolf arc drew to a close. After all what was The Long Game if not one big long feature length "screw you" to the likes of Rupert Murdoch? Nods to the likes of The Weakest Link & What Not To Wear also serve to contextualise things firmly for the thinking couch potato. Precedent well & truly set, no?